Hollingsworth et al., 1980; Lorenc, 1981; Louis, 1979; Temperton and Williamson, 1981; Williamson and Temperton, 1981). Motivated by operational forecast problems, parameterization developments since then include the first envelope orography scheme in 1983 (Wallace et al., 1983); the first shallow convection scheme in 1985 (Tiedtke, 1984); two successful convection schemes, only one of which could be implemented in 1989 (Betts and Miller, 1986; Tiedtke, 1989); an advanced radiation scheme in 1989 (Morcrette, 1990, 1991); the novel 1990 treatment of ocean surface fluxes in the free convection limit (Miller et al., 1992); new formulations of land surface processes including hydrological and vegetation effects in 1994 (Betts et al., 1993; Beljaars et al., 1995); a new parameterization of subgridscale orography in 1995 (Lott and Miller, 1997); also in 1995, a radically new cloud scheme that enforces coherence throughout the physical parameterizations (Tiedtke, 1993); the representation of soil moisture freezing in 1996 (Viterbo et al., 1998); and a major reduction in 1997 of climate drift in extended-range forecasts through coupled revisions of the radiation scheme (based on new spectroscopic data), and revisions of the convection and cloud schemes based on LES studies and field measurements (Gregory et al., 1998a,b). These developments were direct responses to operational forecast problems, based on the best available theories and observations. In numerical algorithms, ECMWF was among the pioneers of the semi-implicit scheme in high-resolution operational global models in 1979; it implemented a successful global spectral model with a new vertical coordinate system in 1983 (Simmons and Burridge, 1981); it implemented a three-time-level semi-Lagrangian scheme in 1991 (Hortal and Simmons, 1991; Ritchie et al., 1995) and has produced substantial efficiency gains in the semi-Lagrangian methodology since then (Simmons and Temperton, 1996; Temperton, 1997; Hortal, 1999). These efficiency gains, together with enhancements in the Centre's computer power, have enabled the Centre to increase both horizontal and vertical resolution to provide more accurate large-scale medium-range forecasts and more detailed and useful products from the forecasts. The current horizontal resolution is TL319 (~ 60-km resolution; subscript L indicates a linear Gaussian grid) and 50 levels in the vertical. As part of these efforts, the Centre pioneered the operational use of shared-memory parallel processors in the 1980s (Dent, 1984) and then pioneered the operational use of distributed-memory parallel processors in the 1990s (Dent and Modzynski, 1996). Lonnberg, 1988; Wergen, 1988; Unden, 1989). It provided excellent analyses of the available data, resulting in excellent forecasts; it provided the basis for powerful new methods of data monitoring and quality control (Hollingsworth et al., 1986); it was a successful vehicle for the FGGE analyses (Bengtsson et al., 1982) and for the 1979-1993 ERA-15 reanalyses (Gibson et al., 1997); it was the basis for important studies of the global observing system; and it demonstrated the serious shortcomings of then-standard methods for using satellite data (Andersson et al., 1991; Kelly et al., 1991; Flobert et al., 1991). It thus provided clear motivation for the development of the four-dimensional variational assimilation system (4D-Var), which entered service in November 1997 and which can make much better use of satellite data. The phased development of the four-dimensional variational assimilation took many years, with operational implementation of a one-dimensional variational analysis (lD-Var) of TOVS radiances in 1991 (Eyre et al., 1993), operational implementation of the IFS/Arpege model in 1994, operational implementation of the three-dimensional variational analysis (3D-Var) in 1996 (Courtier et al., 1998; Rabier et al., 1998, Andersson et al., 1998), and operational implementation of the four-dimensional variational analysis (4D-Var) in 1997 (Rabier et al., 1999, Mahfouf and Rabier, 1999; Klinker et al., 1999). The 1997 operational implementation of 4D-Var includes a number of restrictions and simplifications that will be successively relaxed during the next few years so the system can deliver its full potential. In parallel with continued development of 4D-Var, the next major operational implementation in the development of the assimilation system will be a simplified Kalman filter (Fisher and Courtier, 1995; Fisher, 1998). In the course of these developments, the requirements of the assimilation system led to new demands on the model to provide realistic a priori estimates of the available observations, such as improved surface temperatures over ocean ice, improved ocean surface wind fields, more realistic tropospheric humidity structures, and improved stratospheric temperature structures. Model improvements have thus contributed to forecast skill, both directly through the forecasts and indirectly through the assimilation system. ECMWF has played a leading role in the use of satellite data for numerical weather prediction. The Centre's feedback to the data producers contributed substantially to improvements in the quality of wind products and sounding retrievals during the last 15 years. The Centre pioneered the operational use of sounding radiances in 1992 (Eyre et al., 1993), and was the first operational institute to make direct use of radiances in 3D-Var. The Centre contributed substantially to the engineering calibration of the ERS instruments; ESA's operational scatterometer algorithm was developed and validated at the Centre (Stoffelen and Anderson, 1997a,b,c). The Centre's variational assimilation system is designed to make effective use of satellite data. Among the many benefits expected from the advanced assimilation systems will be the extraction of wind information from the time sequence of satellite data on ozone and water vapor (Andersson et al., 1994). Current preparations for assimilation of MSG-SEVERI radiances, ENVISAT ozone products, and METOP measurements will ensure early forecast benefits from the explanation of each of these data streams as they become available. Since 1992, the Centre's pioneering ensemble prediction system (Buizza et al., 1993; Molteni et al., 1996) has provided a growing range of new products helping forecasters to deal scientifically and quantitatively with large day-to-day variations in the predictability of the atmosphere, and with the implications of these fluctuations on a wide range of weather parameters (Buizza et al., 1999). Numerical efficiency gains and increased computer power have enabled the Centre to provide substantial increases in the resolution of the EPS model, with corresponding benefits for the quality of the overall EPS model and for the whole range of EPS forecast products (Buizza et al., 1998). The Centre's ocean surface wave forecasting project has consistently provided penetrating criticism of the atmospheric model and has provided equally valuable validation of successive model upgrades. 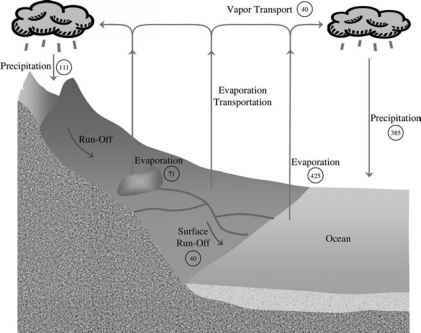 Recent research demonstrated benefits for both atmospheric and wave forecasts of a direct coupling of the two models, and this was implemented in operations in 1998 (P. A. E. M. Janssen, personal communication, 1998). Work on wave assimilation has contributed much to the quality of ESA's radar-altimeter and SAR-wave algorithms (Janssen et al., 1997). ECMWF's project on experimental seasonal forecasting (Palmer et al., 1990; Palmer and Anderson, 1994; Stockdale et al., 1998) is helping establish the predictability of seasonal forecasts. The project has implemented a coupled atmosphere-ocean forecast system that provides experimental real-time ensemble seasonal forecasts to 6 months ahead, using the ECMWF ocean model, the HOPE ocean model from MPI-Hamburg, the BMRC-Melbourne ocean analysis, and the OASIS-CERFACS ocean-atmosphere coupler. Real-time forecasts for the 1997-1998 ENSO event were successful. Because of the exceptional nature of this event, and in response to overarching WMO requirements, the ECMWF Council decided to make a range of products from the experimental seasonal forecast project available on the ECMWF web site (http: // www.ecmwf.int). The planned ECMWF reanalysis, ERA-40, for the period 1958-1998 together with the corresponding NCEP/NCAR reanalysis will provide the range of cases needed to assess more fully the reliability of seasonal forecasts. Progress in seasonal forecasting will continue to depend on active collaboration between data producers and the many research groups active in the area, under the aegis of WMO/ICSU.